I know, I know, it’s only July. It’s far too early to begin thinking about back to school. Right? Well, not exactly. Around here school starts in just four short weeks! Even if the school year starts later where you live, now is a great time to lay the foundation for an organized school year (or fall for those of you without school-aged kids.) 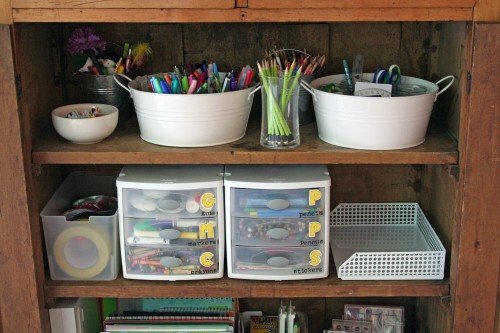 Here are five ideas to whet your organizing appetite! 1. Clean out the mudroom or coat closet. 2. Declutter and organize the kids’ rooms. If you have kids home for the summer, now is a great time to declutter and organize together. Go through clothing, books, toys, stuffed animals and let go of anything your child no longer needs. As before, make a list of needed items for back-to-school shopping. 3. Set up a paper incubator. 4. Set up a school paper / artwork archive. My permanent storage system for school papers and artwork is a 3-ring binder. (Here’s how to create an artwork binder.) You could use a file folder, pizza box or plastic storage bin instead of a binder, if you prefer. The important thing is to set up a spot for these long term “keepers” now. It will save you time and avoid paper clutter when the school year begins. 5. Set up a homework area. All of these projects can be done a little bit at a time, with the help of your kids and they’ll help get the school year off to an organized start! What projects do you have on your to-do list before school begins? 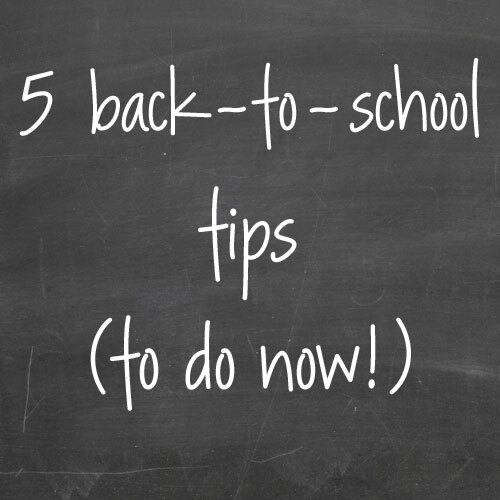 Thanks for sharing your back-to-school tips and ideas in the comments! Such a great reminder! I love being organised for the school year. I have already done 3 out of those 5 so I will get on the other two. Well done Catherine! Sounds like you’re ahead of the game on getting ready for back to school! Good luck with the final two. I realize you do not personally homeschool, but I would love it sometime if you could feature a guest post on tips for organizing homeschool things! Thank you for these tips, however–they are very helpful for everyone! Thanks so much for the suggestion Susan! I did 4/5 of the things you mentioned today! So glad I did.